1 The hardest part, by far, of preparing this dish is peeling, seeding, and cutting the squash. We have bought the sqash already peeled and seeded, but prefer to start from scratch. The freshness promises the ultimate flavor of this simple dish. 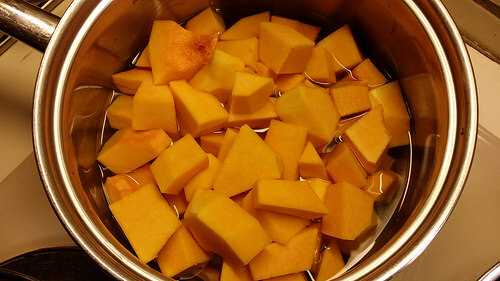 2 Place sqash chunks in large pot, with enough room to fill with water just until the squash is barely covered. Heat this over medium heat and let it come to a good simmer. 3 Let the sqash cook until the water is practically evaporated. Lower the heat, and remove pan from heat as the water fully evaporates. 4 Add the butter and just mix with a spoon. There is no need to mash this unless you want a totally homogeneous mixture. I kind of like the slightly uneven texture we get by mixing lightly with a spoon, just until the butter is fully melted and mixed in. 5 Try to keep the dish hot until serving.